Meetings are held on the first Saturday of the month at 9:30 a.m (except where noted). There are no meetings in the months of July and August. 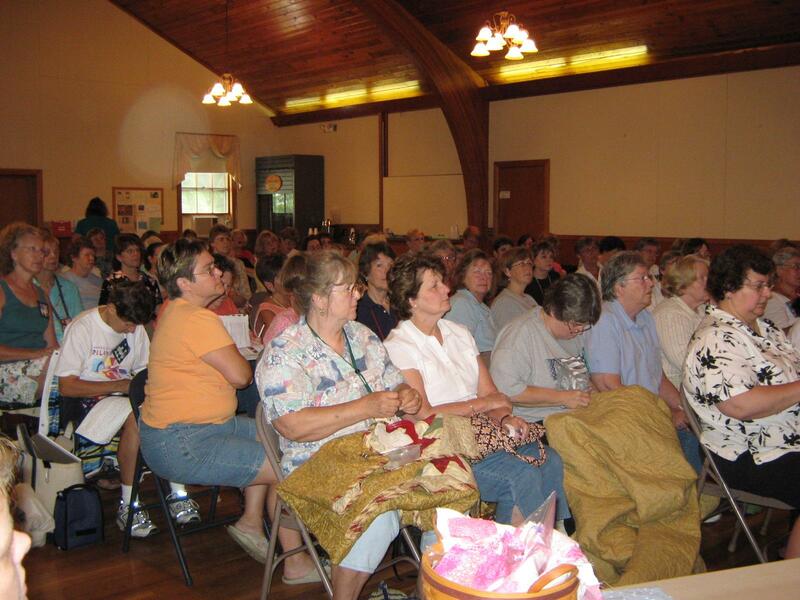 We currently meet at the United Hill Methodist Church, 11 Church Street, Norwell, MA in the church hall. New member and guests are always welcome at our meetings. Please contact us if you'd like to join our guild. Our new Program Committee is busy at work arranging our presentations for the upcoming year. September 8, 2018 (second Saturday due to Labor Day holiday) - We will not have a speaker or class at our September meeting, as we will be using the time to prepare for the quilt show. ﻿﻿We will also be viewing our challenge quilts so remember to bring yours to the meeting as well as show & tell. December 8, 2018 (second Saturday due to church needing hall for their annual bazaar) We will be having our annual holiday luncheon (members with last name A-M bring food) as well as a trunk show from one of our talented guild members, Kathy Rich. January 5, 2019 - After our business meeting we will be having a fun filled day doing a mystery quilt. Bring your machine and have some fun. Sign ups will be done at the November and December meetings. Cost is $20 for the mystery quilt. February 2, 2019 - Our annual Comfort Quilt Sew-in. Bring your sewing machines and spend the day making comfort quilts and getting to know other members of the guild. Kits will be available if you don't have enough fabric at home (wink). July and August there are no guild meetings. REMEMBER TO WEAR YOUR NAME BADGES! When Herring Run Quilt Guild was first formed in February 1989 one of the conditions for membership was making and wearing name badges. The motivation behind the badge requirement was to make it easier for members to get to know one another. As our numbers have increased, it has become even more important than ever to honor the intent of our founding mothers. Please wear your badge. Your intricate identifiers help us to put names and faces together. Besides, it’s not like you’re working in the customer service department, we’re having fun! We look forward to the day when we no longer need to collect fines for badges not worn! We have two different versions of our name badge, one with the HR symbol and one of a paper pieced fish that was designed by Carol Doak. Click here for directions on how to make a Herring Run Quilt Guild name badge. Sunshine Information: Do you know of someone in the guild that has had a personal loss or is seriously ill? Please pass this information on to our Vice President, Edith Neil at﻿﻿ f.neil@comcast.net so we can send cards, flowers or donations from the guild. Please make sure you give her the full name, address and information on where to send a donation if one is requested. Workshop registration: You will need to pre-register and pay at the same time to hold your space. Hospitality: It is every HRQG member’s caloric duty to contribute to our communal sustenance for at least one meeting per year. September’s goodies are provided by your board members. WE'RE GOING GREEN!To help protect the environment, honor the requests of the Church, and cut down on our monthly bills, we would like guild members to bring their own coffee mugs to the meetings if at all possible.